Previous PostThe Green Energy Act, Part 1Next PostWhat is a 'navigable waterway'? I love squirrels. The black ones outnumber the gray ones in our yard by far. We do have one red squirrel. He’s my definite favourite, small, quick, and tougher than the other ones! 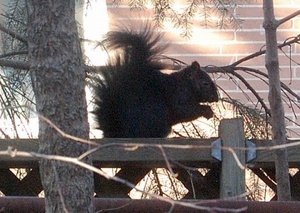 Squirrels are one of my favourite city critters. They are very smart. We had to install a baffle on our main bird feeder to keep them away. Funny thing is, I still see them around that feeder. They haven’t given up. I know they’re planning something… doing the physics in their head. We have red squirrels out here in the boonies; smaller than the gray/blacks and even hardier. And no bird feeder is safe from them. They are Olympic level acrobats. Occasionally a grey will appear (we figure they are being dumped from city dwellers’ live traps because our road looks so deserted) but they never stay. Do they try to get home again or do the reds kill them? Only I think it may be the other way around.